Start by placing the potatoes in a large saucepan. Add a teaspoon of salt and cover with water. Don’t peel the potatoes, because the skin helps keep the potatoes together. Bring the water to a boil over medium-high heat. Reduce the heat and cook at a low boil until they are tender enough to slide a knife in easily. It is important not to over-boil them, for golf ball size potatoes about 10 minutes or a little less. 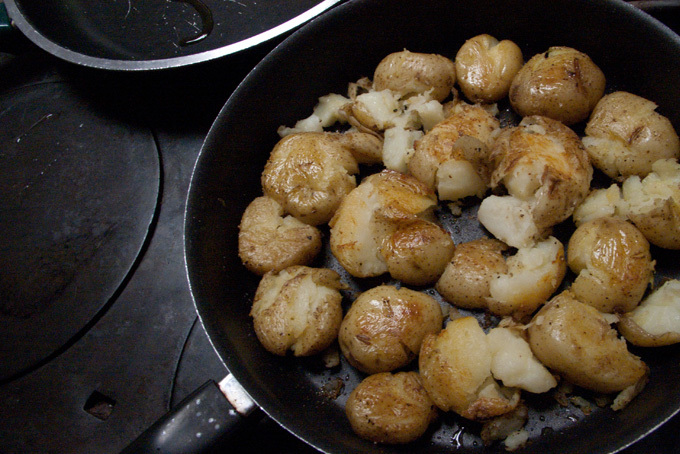 Drain the potatoes and refrigerate until you are ready to brown them in a large skillet. Heat the olive in a large skillet over medium-high heat. Keep in mind it needs to be big enough to hold the potatoes, which double in size when they are smashed. Smash each potato with a masher or the bottom of a heavy glass. Season with salt and pepper and cook until crisp, and them turn and cook the other side. Sprinkle with chives, fresh herbs, whatever and serve.